As a landlord, your primary goal is to protect your investment. You need to make sure that you rent to responsible tenants who will pay their rent on time, not break the lease and keep the property in the good condition throughout their lease. 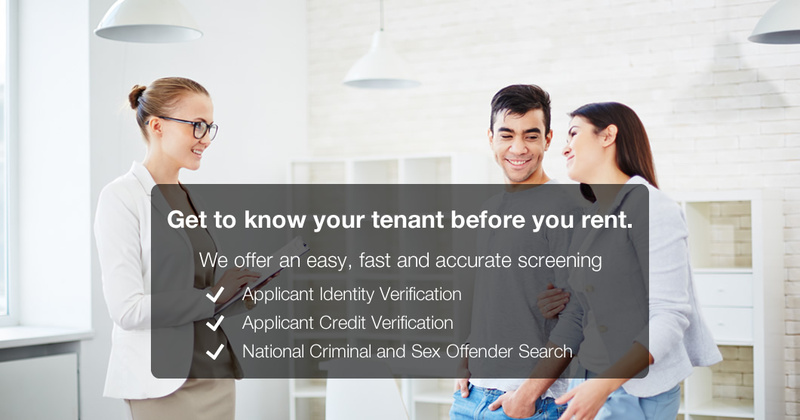 Our tenant check solution helps you make the right decision before you rent. Establish your applicant’s identity, address history and personal responsibility. If your candidate has been convicted of a felony or serious misdemeanor, youʼll want to know the details. Insulate your organization from workplace accidents, violence and rising health care costs. Determine eligibility for driving a company vehicle for business use. Confirm information provided on a resume or job application.